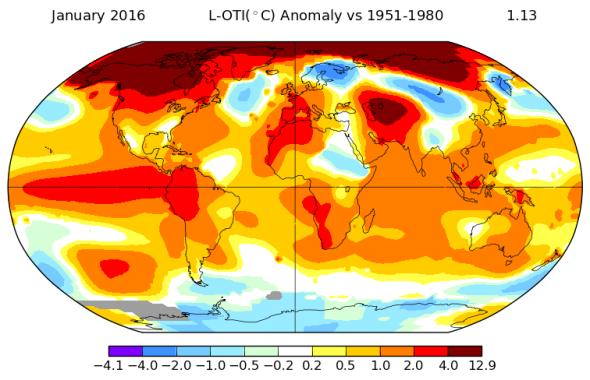 January 2016 was Earth's warmest month yet. January 2016 was Earth’s hottest month yet, with the most unusually warm temperatures concentrated in the Arctic. It would be hard to top 2015—a year unlike any other in human history—but 2016 seems to be giving it a shot. According to the latest data from NASA, issued over the weekend, January was the planet’s most unusually warm month since we started measuring temperature in 1880. No other month in the preceding 1,633 months has deviated this far from what was once considered “normal.” Data independently produced by Japan’s Meteorological Agency confirmed that last month was the hottest January on record globally. Last month broke the all-time January record by the widest margin of any month on record, a full one-third of a degree ahead of last year’s record pace. That means the planet is already on track for an unprecedented third straight year of record-setting temperatures. There’s a single major reason that this global temperature spike is happening right now: The current El Niño is now officially the most intense ever measured, at least by the most common definition. But humans are also playing a major role, especially in the Arctic, where El Niño’s influence is limited. It’s not entirely known how much the buildup of atmospheric carbon dioxide is affecting the natural El Niño phenomenon, but mega events like this year’s might be getting more frequent. Last month’s impressive warmth was concentrated in the Arctic, where average temperatures were as much as 23 degrees Fahrenheit above normal. (That’s like New York City averaging 62 degrees every afternoon for the entire month of January.) Arctic sea ice is now at an all-time low for this time of year. Nowhere on Earth are temperatures climbing faster and the consequences are profound: As ice melts, it reveals darker water, which more readily absorbs the sun’s energy, leading to more melting. In a particularly hard-hit spot—the Barents Sea, Kara Sea, and the East Greenland Sea north of Europe, where the abnormally warm Gulf Stream current terminates—the base of the oceanic food chain is at risk as plankton numbers plummet. The resulting shift in weather patterns from the warmer water there may have also contributed to January’s blockbuster blizzard on the East Coast.